You faithful readers know that I'm a big fan of baseball. I revisited the stadiums I have been lucky to visit here. I talked about last year's world series and how many of the Yankees were former Rangers here. We took Mari to visit the Ballpark on her almost 6 month birthday. Last year, I was able to see my name in lights again when I celebrated my birthday there with many, many family members, just like when I turned 12 and Daddy took me and my friends to the old Arlington stadium to heckle Bo Jackson. In those days we cheered on Pete Incaviglia and Ruuuuuuben Sierrrrra! In college, I cheered for Pudge Rodriguez and Juan Gonzalez, the mighty Puerto Ricans! I still remember the first time I visited the new stadium, the Ballpark in Arlington. 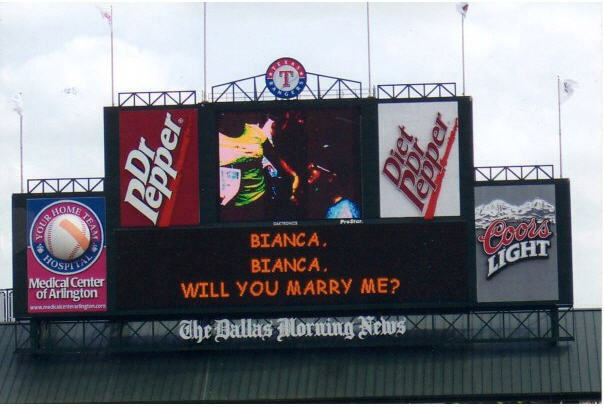 The Rangers managed to win that day. On the outside, I told everyone I would be happy regardless of the outcome, and frankly, my head was elsewhere that day, yet, I still rooted for our guys, especially because A-Rod's departure to the Yankees was a thorn in my heart. A part of me always wanted the Rangers to win, but time and time again, it was the Yankees in October, so I took small comfort knowing one of the two would be representing. But when they come head-to-head, I'm always a Rangers fan, despite being witness to more losses than victories against them. So here we are, battling the Yankees for the ALCS. Each night, I am glued to the TV and when I feel my blood pressure rising, I change the channel and fix my eyes to my facebook account waiting for the fan updates. So many play-by-play updates, it is almost like watching the TV. When I know it is safe for me to watch again, I will turn it back. The rituals the same, always. Every 7th inning, I stand up and sing along to God Bless America even though I know I can never finish the song because I'm always crying. Again, I can't believe it. I do believe, but it is unbelievable! Our guys, they are here. They've been in the show all along, but now they are center stage and every night I watch them, I get so full of pride and happiness. Each night after the game, I want to call my father and gleefully revel in the joy. Baseball has always been our thing. It's our family thing, but a very special thing between my father and I. When we trek to the stadium from the parking lot, I'm instantly a kid again, clutching the coupon for the discounted program, wearing our Ranger gear, in excited anticipation of what the game will hold. This year, summer has been stretched a little bit longer, along with it, hope. It's so great to know that Mari already likes it as much as I do. It makes me even happier to know that no matter the distance between our family, we are all listening and/or watching the game. Go Rangers!